Review books a-plenty – And a GIVEAWAY. I am SO behind on thanking publishers for the wonderful books they keep sending my way, and if you're an author with a current request pending please know I'm not ignoring you! I have over 600 unread messages in my in-box at present. I think I need to weed that over the weekend, eh? 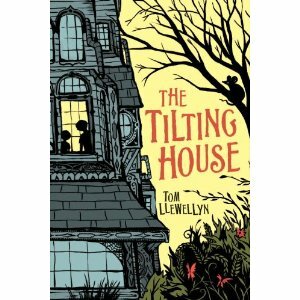 But one book I did want to mention is this gloriously wonderful children's book (ages 4-8) called The Tilting House. It's so, so much fun! Let's do a give-away of this one. What the heck. I don't have a 4-8 year old anymore, and kids NEED to read this book. It features the house with tilted floors, of course, plus talking rats, funeral directors who predict deaths (not in a terribly scary way, don't worry), plus the promise of treasure hiding in the house… Great for a summer read. Publication date is June 8, but I can save you the $ 15.99. It'll be my reading copy, but trust me I'm very gentle with my books. Just leave me a comment and you're entered! Winner chosen by random drawing. Contest ends midnight Tuesday, June 8 Central Standard Time (Chicago). Ooh ooh! I’m all about building Greyson’s library, so I’d love to enter to win! It looks delightful. The cover is spooky-fabulous! Ooh, would love to win this! Thanks for the chance! Previous Post I’m a star! I’m a star! I’m a star!